After the release of five colourways earlier this year, Jordan Brand is set to release to more colourways for the Jordan SS, which made waves during its first release last July and its latest edition that was released last November. 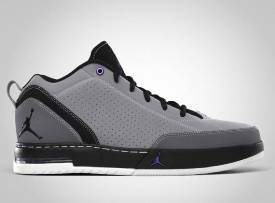 The White/Metallic Silver and the Stealth/Black-Varsity Purple-Light Graphite editions of the Jordan SS are set to hit the shelves this month, and like its predecessors still features its simple but elegant appearance and its strong casual feel, which is somewhat similar to the famous Air Jordan 3. So if you want to bring your game into a new level, while paying for less, then you should not definitely miss the new editions of the Jordan SS when it hit the market this month.